The newest small business financing technique – also known by several other names, such as business cash advance, merchant funding, merchant account cash advance, or merchant cash advance – provides retail and service business owners with credit card sales, quick and easy access to working capital financing. Los Angeles Businesses need working capital to function. In a sense, working capital is the grease that keeps all businesses running smoothly. Without it, they would cease to operate smoothly and get further and further behind their competition. We need working capital for things like paying bills, buying inventory, marketing or making payroll. What generally happens to the many businesses that try to function with a deficit is that they dig themselves into a hole that becomes more and more difficult to get out of. The older, more traditional Los Angeles business financing methods – accounts receivable financing (particularly receivables factoring and asset based lending) and purchase order financing – exclude most LA-based retail and service companies who do not invoice their customers. 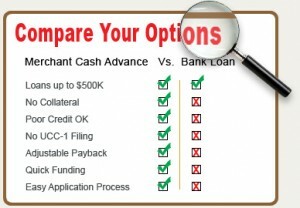 So in the late 1990s, business merchant cash advance was introduced to Los Angeles business owners to fill this need. How Does Credit Card Merchant Cash Advance Work? A business cash advance is not structured as a loan but, like receivables factoring, is an advance. Instead of an advance against invoices, credit card factoring providers offer businesses a lump sum payment in exchange for a share of future credit card sales receipts. Also, like receivables factoring, the merchant business cash advance is made at a discount to an anticipated face value of credit card receipts, but rather than collecting on invoices, the credit card factoring provider will be entitled to the client’s daily sales that are paid with customer credit cards. For example, a business cash advance provider might offer to deposit $8,000 into your bank account today in exchange for $10,000 in future sales. The provider will directly collect a set percentage out of your daily credit card sales until it recovers $10,000 – the $8,000 originally advanced and a $2,000 premium. Collection is spread out over a pre-determined time frame so that it won’t negatively impact your businesses – an important benefit because the amount you pay will vary with your cash flow. During slower months, you pay less; in better months, more. Compared to a bank loan or business line of credit, which has a firm date that it has to be repaid with fixed payments, a Los Angeles business cash advance affords tremendous flexibility. You have no due date, no fixed payment. The catch? On an annualized basis, a business cash advance is quite expensive when compared to the interest rate on a bank loan or business line of credit. Make sure you understand what the costs are so you can determine if merchant cash advance is a solution for your small business. How Much of a Merchant Cash Advance Can My Los Angeles Business Quailfy For? A business cash advance is based on the monthly credit-card sales history of your company, so the larger the average credit card sales volume, the greater the advance you will be allowed. Advances of $20,000 to $50,000 are the industry norm, but for larger companies, they can be $150,000 or more. Who Can Use Credit Card Factoring? Merchant Cash Advance funding is readily available to many retail businesses – such as restaurants, clothing and apparel stores, health clubs, etc.– and service companies that have been in business for at least one year and which average at least $3,000 in credit card sales per month. If your company is newer or you have less than $3,000 in average monthly credit card receipts, you will have fewer providers to choose from, but as credit card factoring becomes more widely known, new providers continue to enter the field. Consider talking to a commercial loan broker or small business financing consultant for help locating a smaller, or niche factoring company that will work with you. Where Can I Find A Business Merchant Cash Advance? Though still not well known or understood, merchant cash funding has grown substantially in recent years, with the tightening business credit environment driving demand. You can do the research yourself to locate a suitable provider, often a painstaking and difficult task, or work with a commercial loan broker or small business financing consultant to save time and money. As is the case with traditional receivables factoring, you can use the services and industry contacts of a consultant at no additional cost, since they are compensated directly by the financing provider. When The Banks Say “No” Credit card factoring is an important enhancement to the available small business financing mix. As an alternative to the relatively slow, cumbersome, and inflexible bank loan or business line of credit, it has no equal, especially in the small business financing arena. In today’s tight business credit climate, finding business loans with bad credit or no credit and little or no collateral is next to impossible. merchant cash advance Credit card factoring offers a flexible way to manage cash flow, build business credit, and grow your company – all the while opening the doors to traditional business financing.